Holiday shopping has swung into full gear. But while others elbowed their way to Black Friday deals and clicked on Cyber Monday savings, you sat on the sidelines. Maybe you always put off holiday shopping until the last minute. Maybe you’re daunted by the thought of coming up with a list, let alone checking it twice. Maybe you think the entire process is a bit of a drag. Not to worry: Your iOS device can also double as a holiday season assistant—if you equip it with the right software. A number of App Store downloads offer to help you by managing your gift-giving every step of the way. Of course, you don’t want to add shopping for such an app onto your already lengthy list of holiday to-dos. That’s where I come in—I’ve spent the last week looking at seven iOS gift list managers, and I now have a good idea of which apps will help you tackle your holiday shopping. Not surprisingly, a lot of these apps sport similar capabilities, but a few stand out by implementing those features in intuitive ways. Let’s first dispense with the apps that came up short in my testing. When looking for a gift list manager, you want to avoid apps that are either organized poorly or lack critical features. If an app isn’t going to save you any time or help you stay organized, then you’d be better off sticking to making a list with pen and paper. Apps that don’t allow you to specify enough detail just aren’t very helpful, either. Of the apps I’ve looked at, Drag & Drop Christmas List ( ) can at least claim to take the most unique approach to organizing your shopping list. Unfortunately, that approach just doesn’t work as well as it should. In Drag & Drop Christmas, each name on your list gets assigned to a stocking. 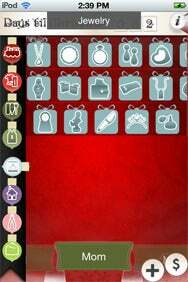 From there, you drag and drop icons from several different gift categories into the different stockings. While the preset list of gifts turns out to be pretty extensive, they’re a little too generic to really be helpful in organizing a list. And the stockings, while fun at first, aren’t very efficient when it comes to navigating through your list, particularly if you’re giving gifts to a long list of people. 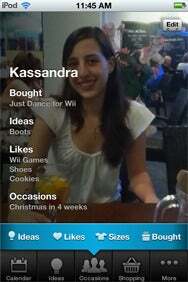 I appreciate the app’s creativity, but its execuetion falls flat. Poor execution also does in My Christmas List ( ), which looks more like a grocery list than one for festive present buying. The app’s looks aren’t deceiving—it takes an overly bare-bones approach to list management. Fortunately, the other apps I looked at are more than up to the task of helping you stay on top of your gift-giving. Common traits among successful gift list managers include solid organization and the ability to add in the kinds of details that help your actual shopping run more smoothly. The really successful apps understand that you don’t want to dedicate your holiday season to constructing lists, so they offer functions such as sharing and contact syncing to help save you time. Online shoppers, in particular, will appreciate software that incorporate some e-commerce element directly into the app. If you plan on doing the bulk of your shopping offline this year and only need an app to help organize your list, then Santa’s Bag ( ) or The Christmas List ( ) will meet most of your needs. Both allow you to easily organize your list into different groups, indicate the status of each gift, and specify price and store. Santa’s Bag has the slight advantage in that you can import people from your list directly from your iPhone’s contacts, a feature The Christmas List regrettably lacks. Also missing from The Christmas List is a dedicated budget feature. However, it is easy to view how much you have spent so a separate budget function isn’t completely necessary in this case. Both Santa’s Bag and The Christmas List let you share your lits in a nice chart via email, though it can be difficult to find that feature in Santa's Bag. That said, Santa's Bag does let you sync with your Dropbox account. If online shopping is more your thing, iPresents ( ) is a good option. While it won’t sync with your Contacts app, you can shop directly from within iPresents. Each time you add a new gift, the app lets you look up the item on the websites of seven different retailers or on Google. Ultimately, though, I found my favorite apps turned out to be ones that had a life beyond the holiday season. 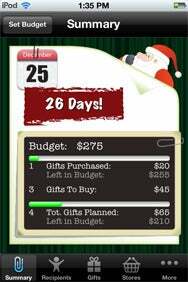 These apps, designed to help you stay on top of gift-giving the other 11 months of the year, tend to be better organized while offering more control over the finer details of your lists. If you’re also looking for that kind of versatility, you should consider Gift Plan ( ) or No More Socks ( ), which are, without a doubt, my two favorites. Both offer organized year-round gift planning functionality. Gift Plan syncs with your Facebook friends and imports their birthdays directly into the app so you never have to worry about missing a friend’s birthday. Furthermore, if you appreciate a well-designed app, you’ll love the stunning graphics of Gift Plan. Its elegant design is easily its best feature. But if you want functionality, No More Socks offers the best bang for your buck. Like Gift Plan, it’s versatile enough to use year-round, but it takes gift planning to the next level by seamlessly incorporating shopping and sharing into the app. You can shop online directly from within No More Socks and easily compare prices between dozens of retailers. No More Socks isn’t the only app that will share your lists via email, but it is the only one I’ve seen that uses sharing to tackle what can be one of the most difficult aspects of holiday shopping—finding the right gifts for everyone on your list. Other apps have areas for brainstorming, but No More Socks takes this a step further by leveraging its community of users to help you come up with gift ideas. Of course, your favorite gift-giving manager will depend on your particular needs. But if you’re struggling to get a handle on your gift list, the knowledge that there are some capable apps out there should bring some measure of holiday cheer. This article was updated on December 6 to correctly state that Santa’s Bag allows you to share lists via email.